Dr.Kumaravel is a lecturer in Department of pathology, R.V.S. Homoeopathic Medical College, Coimbatore. 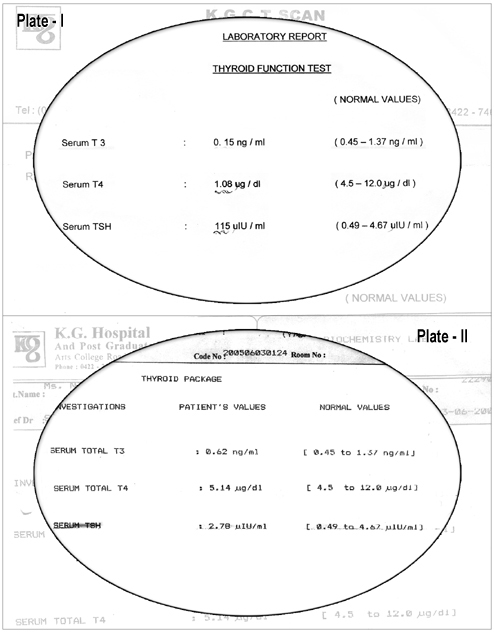 He had presented many scientific papers and here he presents a case of hypothyroidism responded well to his treatment. He has presented evidence based investigation reports. The patient gained weight since 4 months. She suddenly gained her weight around 8kg/month. She also had weakness of the body, could not do the routine work and always feel tiredness and sleepy mood. She also presented with the complaints she had puffiness of face, which increased in daytime. No significant history of suggestive Diabetes mellitus, Hypertension, Bronchial asthma, Tuberculosis and similar complaints. She got married at the age of 23 yrs. It was non-consanguineous marriage. Father is having Tuberculosis. Perspiration - profuse, no stain often offensive. Menses - Regular, Menarche at 13 yrs 27 days cycle /5days /bright-red without clot, Menses - Occasionally back ache during menses,profuse bleeding for 5 days since 4 Menses - months, No other discharge. From this observation, the patient complaints diagnosed to be HYPOTHYROIDISM. No complaints. The patient feels happy.